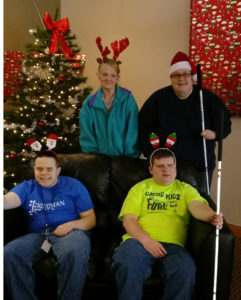 Friedman Place announces its first annual Giving Tree for its 85 adult residents who are blind or visually impaired. All residents are either in poverty or have very low income and most residents have, on average, 5 health concerns other than blindness. Your gift would mean so much to them at this time of year. Friedman Place staff and social work interns have asked residents for a gift ideas and most items cost $25 or less such as: pajamas, sweaters, blankets, slippers or gift cards to stores like Walmart or Target. These everyday items are small luxuries that they cannot afford to buy for themselves. Gift tags with the residents’ wishes will be hung on a tree in the Friedman Place lobby beginning on Wednesday, November 15th. You may stop by any day of the week: Monday-Friday from 8:30 a.m. – 5:00 p.m., or on Saturdays or Sundays from 10:00 a.m. – 1:00 p.m. We ask that you please return the purchased items wrapped and with the tag attached by Monday, December 10, 2018. If you are unable to come in or would just like to sponsor a gift, call Kathy Gregg at 773-989-9800 to arrange. We will have a gift exchange shortly thereafter. For many this may be their only gift. We hope you will help make this holiday special for one of our residents.